In most anime and manga series, our characters are usually in school but yet we rarely see them really doing homework or taking tests. And of course we wouldn't - that's all the most boring stuff of daily life! It's the social aspects that make going to school more interesting, and this is certainly the case for Yuki. Throughout his high school career, he deals with a horde of fangirls and also his participation in the student council, the former being an isolating factor for him and the latter being an opportunity for him to spread his wings. Yuki is quite well-liked within his school. As one of many genetically blessed members of the Sohma family, he has quite a number of girls after him, but naturally he can't get close to them because of the zodiac curse. To add onto that, there is a Yuki fanclub of sorts that tries to prevent other girls from getting close in their idolization of and obsession with him. As such, Yuki is well-liked but pretty friendless, mostly admired from afar. Thus, as a responsible student, he's put up to be the next student council president by the previous president, who has high expectations for him. 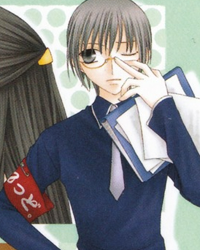 Yuki, however, is reluctant to take the job - after all, Ayame was president in his heyday! But that's not the real reason for his hesitance ... he doesn't feel that he's a natural leader, and his self-confidence simply won't allow it. After Tohru's encounter with Kisa, though, Yuki realizes that the presidency is exactly what he needs to overcome this weakness. With his presidential duties, however, comes dealing with the rest of the council, most of whom he initially struggles with but comes to appreciate as friends. Of note are Kakeru Manabe and Machi Kuragi, who I'll discuss further in subsequent pages, but here's a quick shout-out to the flirtatious and "cutesy" (I personally am not a fan of these kinds of people) Kimi Todo, who affectionally calls Yuki "Yun-Yun" much to the ire of his fanclub, and Naohito Sakuragi, a workaholic of the student council who is jealous of Yuki because he's in love with the number one member of Yuki's fanclub. Yay for unimportant characters! Machi Kuragi - one of few to honestly see Yuki as less than a "prince"